In the 1970s, the Urbano Calamini firm began its activity of extraction of the Pietra Serena of Firenzuola. At that time, the extraction procedure was limited to the blocks present in the outcrops, where therefore the “uncovering” manoeuvres were considerably easier. That Pietra Serena was sold as raw material without further processing. For years the Pietra Serena had been a typical material of the Tuscan area of Firenzuola. 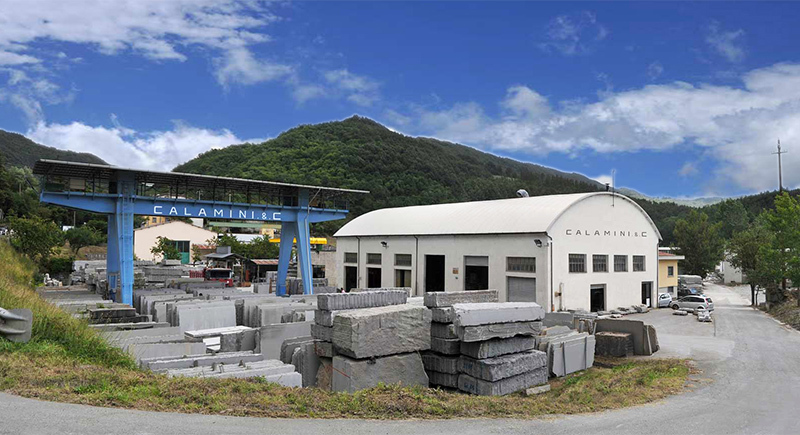 To support its processing, Urbano Calamini opened a small sawmill and a laboratory, where he began to work on his own stone blocks extracted from the “Ricavoli” and “Della Guardiola” quarries. The company is located in Firenzuola, in the historic mining area of Pietra Serena. All the handling and storage activities of the blocks coming from the company owned quarries and other raw and semi-finished materials take place within a large yard. Production and processing activities are carried out in equipped covered areas and inside a workshop that also houses two workstations, designed for the processing of slabs at the blocks handling area. In the outdoor storage area for raw materials, there is also a single-blade frame for sawing and squaring the blocks. The structure is completed by a covered area that houses the administrative and management offices. Over the years, upon Urbano Calamini’ sons entering the business, the firm had a significant growth with a great differentiation in production to cope above all with the growing demand for products in Pietra Serena. The Brento Alta quarry is located in the quarrying basin of Brento Sanico, in Firenzuola area, 800 meters above the sea level. 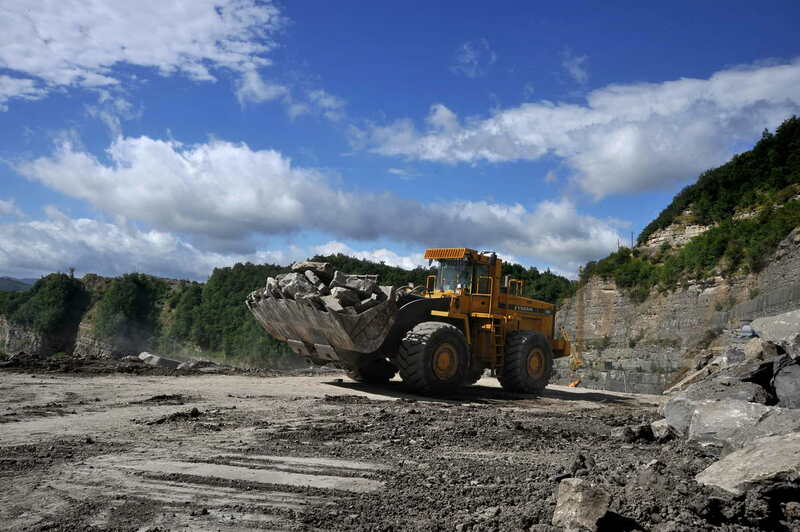 The quarry consists of mining claims which cover a 70.000 square meters area and a 25.000 square meters quarrying area; the annual digging amount is 40.000 cubic meters of which 8000 are ornamental Pietra Serena to be worked. The most advanced and sophisticated systems used in the quarrying activity, guarantee the best results in the digging, the highest safety standards and the least environmental impact. Also, the organization system guarantees a constant supply even for large demands. 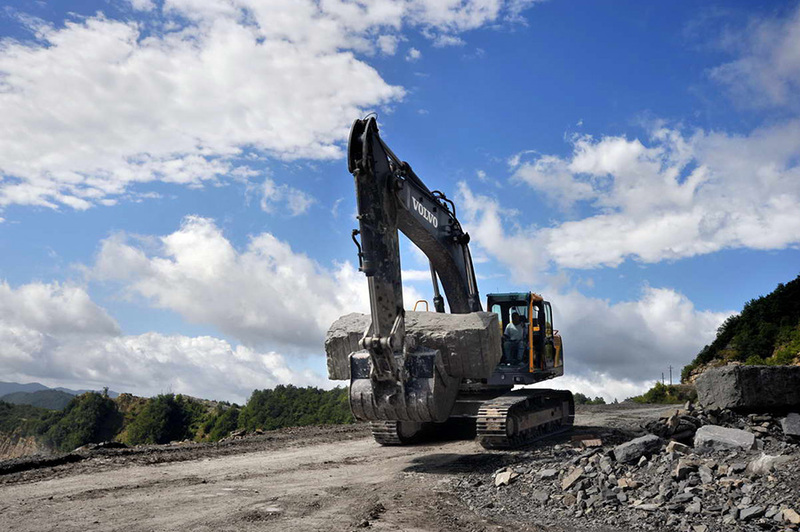 The quarrying of Pietra Serena is organized in several steps. Open-pit quarries first require the removal of the upper layers of soil. Afterward, the useless upper bedrock, is removed using excavation methods or explosive sticks. Once the valuable layer is uncovered, the next step is the quarry cultivation. Some splitting machines perform cylindric holes then filled with detonating material and water. The extracted material is then unflawed, selected and moved to the factory. The waste matter is sent to a designated dump and later recycled for urban reclamations, dykes, river banks, containment works, stone chippings and stabilizers. This delicate operation necessarily requires special vehicles and dump trucks. In the process of promotion of the Pietra Serena and reinterpretation of its uses, the company has been improving and optimizing its management and technical skills. The treating of the rough stone takes place in the main workshop, inside designated areas equipped for different kinds of production. Such production chain allows to achieve a consistent range of standardized and customized products. The machineries are automatic and they allow to monitor and control every operating phase in order to guarantee the highest quality standards. The production intended for the restoration of historical centers and architectural elements is the result of a synergy with selected architects; it is powered by the most advanced and efficient researches on the preservation of the historical heritage. After the rough blocks are delivered to the factory workshop, the cutting process starts. 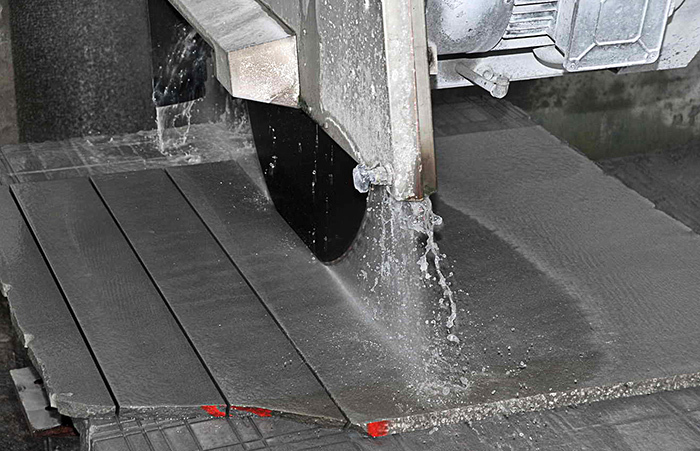 The sawing phase allows to obtain different thicknesses of the slabs using special diamond saw blades. Most stone slabs are sold this way, while the remaining amount is re-stored, selected and coded in order to get refined according to the customerʻs request. Thanks to highly skilled and experienced stone-masons, Calamini also produces unique hand-carved crafts. Such products, carefully designed and refined in details, may satisfy any specific need. The machineries used for this operating phase are one-blade or multi-blade special saws along with technically advanced automatic machines. The final and unique touch is lastly provided by the prestigious stone-carving tradition belonging to the company.